How Practical Am I? My 2 Pesos Could Go a Long Way! It's not a hidden fact that I am a "kuracha" Mommy. "Kuracha" in contemporary Filipino language means one who does a lot of things at a time or one who wears different hats and seems like she never gets tired doing so. Here are the life roles I play: A wifey, a working mom, a blogger, a band vocalist, a part-time TV commercial talent, a part-time memorial plan sales agent, and a businesswoman too. Sa panahon ngayon, we should be practical diba? That's why I believe in monetizing your skills or talents and I cannot stress enough how important investing in yourself is (even wrote about it HERE and HERE.) For me, practicality means getting a quality of life without sacrificing your family's budget. AND also you should know how to make money and save too! I have been asked by mommy friends and even colleagues this question, "Talaga bang Mommy Practicality ka?" They would run plenty of jokes to prove that I'm not (but they don't succeed of course!) to challenge how practical I could get. Wow ha! For someone who even during sale season in malls thinks twice about getting that really nice dress or purchasing that marked down stilettos, who brings lunch baon to work (almost daily), who enrolls to mobile/data unli-promos and never stops thinking of ways to earn, who would even think I am impractical? But mind you, I am not stingy when it comes to expenses, I just prioritize where our money goes and also make sure that we get the best value in every peso spent. Nakaka-relate ba kayo mommies? Here's one practical example on our mobile subscription. Did you know that I could get my 2 pesos worth a long way? That's possible with SUN Cellular's #SunAdd2. I just add 2 pesos to my selected Sun Prepaid load and I could already have all day unlimited Facebook especially when I need to update my Mommy Practicality FB Page, OR I could also have all day unlimited chat to family and friends here and abroad through Viber, WeChat and Line OR I could also have all day mobile surfing of up to 5MB to get the latest news, share inspiring contents and even blog during commuting hours! Now that's getting MORE value for money talaga loves! 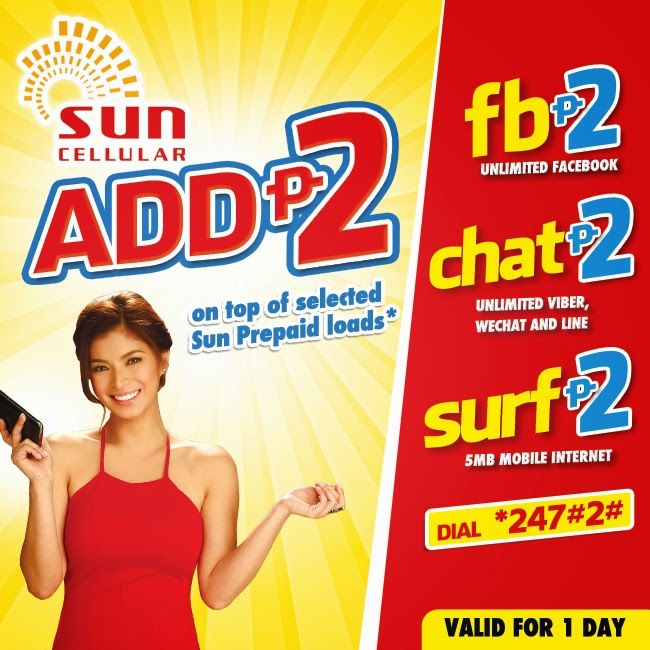 To avail of #SunAdd2 just dial *247#2# on your Sun Prepaid phone. AND, dahil nga practical ako and I always want to have a good choice, like Angel Locsin, Mommy Practicality has been chosen as one of SUN's digital brand ambassadors. I'm so excited about this partnership because we really are SUN subscribers at home. Now backed up by a stronger & better network due to Sun Cellular’s integration with the Smart/PLDT group, to be able to share more about our experience with their service is a pleasure. So, expect to hear more good news from me about SUN Cellular's latest products, services and promos too! For more info on #SunAdd2 you may check their website website, like SUN Cellular of Facebook, follow them on Twitter and Instagram.